President Trump on Monday proposed shifting the nation’s air traffic control functions from the federal government to a private nonprofit organization, and held a signing ceremony for a list of principles to send to Congress. Under the Trump proposal, air traffic control operations would be removed from the purview of the Federal Aviation Administration and become a private nonprofit group, governed by an independent board of directors made up of representatives from airlines, employee unions, and general aviation and airport trade groups. The 30,000 employees who perform air traffic control would shift to the new nonprofit entity, and the new organization would be required to honor existing collective bargaining agreements. Instead of taxes funding the organization, the new nonprofit entity would establish a user fee levied on flight passengers. 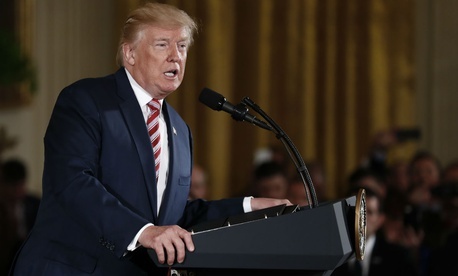 In a speech Monday, Trump said the plan would improve the United States’ ability to implement a system for tracking aircraft via GPS, rather than radio and radar communications. DJ Gribbin, special assistant to the president for infrastructure, said in a briefing with reporters that the administration’s proposal will improve safety because it allows the FAA to conduct more objective oversight over air traffic control. The National Air Traffic Controllers Association supported Shuster’s bill last year. On Monday, NATCA President Paul Rinaldi issued a tentatively optimistic statement about Trump’s proposal. But other employee groups remain unconvinced. A group of seven unions representing FAA employees, including the American Federation of Government Employees, the FAA Managers Association and the National Federation of Federal Employees, sent a letter last month to members of Congress opposing any effort to privatize air traffic control. Sen. John Thune, R-S.D., who chairs the Senate Commerce, Science and Transportation Committee, noted in a statement that any bill reforming air traffic control would require Democratic support, which historically has not been forthcoming when privatization is on the table.